Chapter headings: Editorial Advisory Committee. List of Contributors. Preface. Pathogenesis and host specificity in plant pathogenic prokaryotes (U.S. Singh et al.). Bacterial soft rots (M.C.M. Pérombelon, G.P.C. Salmond). Erwinia amylovora (J.L. Vanneste). Pseudomonas syringae pathovars (K.W.E. Rudolph). Pseudomonas solanacearum (A.C. Hayward). Pathogenicity of the black rot bacterium Xanthomonas campestris pathovar campestris to Crucifers (A.E. Osbourn). Xanthomonas campestris pv vesicatoria (R.E. Stall). Xyella fastidiosa (D.L. Hopkins). Signals to and emanating from Rhizobium largely control symbiotic specificity (R.Fellay et al.). Agrobacterium (B.G. Clare, N.C. McClure). Pathogenesis of diseases associated with mycoplasma–like organisms (C.J. Chang, I.M. Lee). Coryneform and related bacteria (A.K. Vidaver). Streptomyces Pathogenesis (J.L. Schottel). Hrp and Avr genes, key determinants controlling the interactions between plants and Gram-nagative phytopathogenic bacteria (F. Van Gijsegem et al.). Genes involved in bacterial pathogenesis of plants (J.L. Dangl). 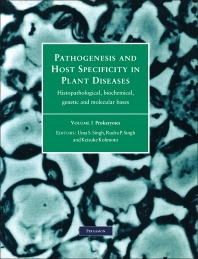 Forms part of the three-volume set, Pathogenesis & Host Specificity in Plant Diseases, and deals with pathogenesis and host specificity in plant pathogenic prokaryotes. Pathogenesis & Host Specificity in Plant Diseases as a whole is the first complete publication covering the mechanism of host specificity and pathogenesis in plant diseases, bringing together all knowledge about plant pathology into one fully comprehensive source. The main aim of the work is to compile, critically analyze and correlate the information available on all aspects of pathogenesis and host specificity in important plant-pathogen systems representing different types of parasitism and symbiotic, mutualistic and antagonistic associations. Over 100 authors have contributed state-of-the-art chapters, all of whom are internationally recognised as leading experts in their fields. Subject matter is clear and readable throughout and is supported by clear diagrams, tables and photographs. Each individual volume is available separately or in a three-volume set.